With the beautiful weather we are having right now, I knew it was time to decorate for Easter and begin preparing for Spring. I started with reusing my spray painted branches that I’ve been using since last Easter. I used them in the Fall and Christmas time too. 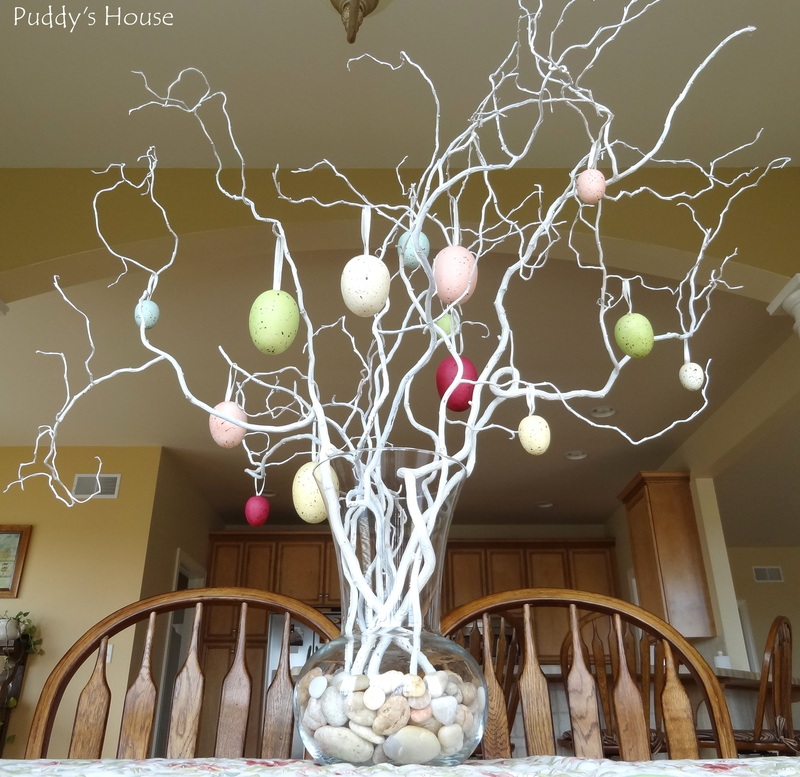 I put rocks in the bottom of the vase and hung speckled eggs on the branches. 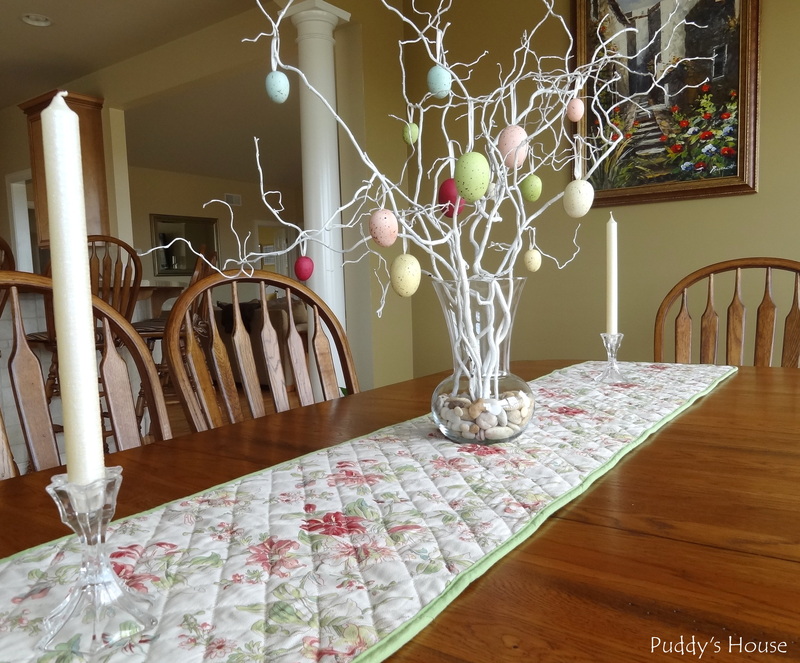 I placed everything on a spring runner and added the candlesticks that I used at Christmas. 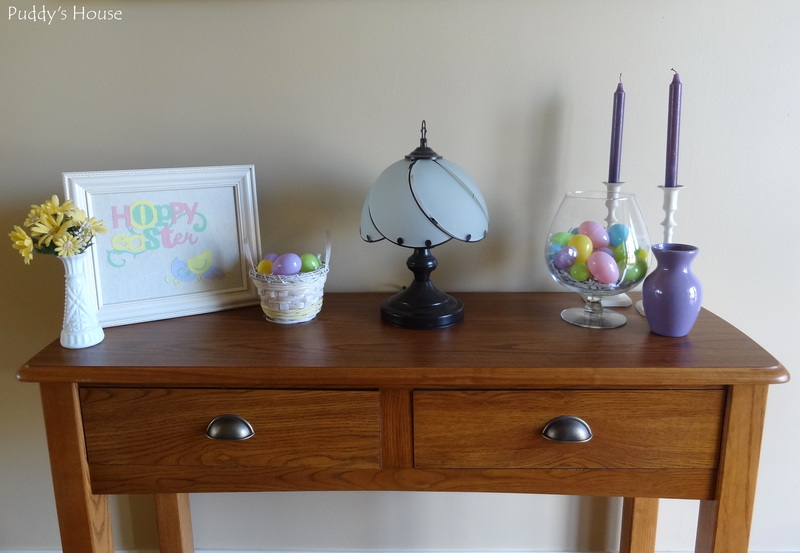 The next area that got a touch of Easter was our mantle. My Mom gave me her ceramic Easter village a few years ago. Last year I used it in the foyer, but I decided to try it on the mantle this year. I’m not sure if it will stay there or not, but I like having some decorations in the living room. The nice part is there is an outlet on the mantle, so it is very easy to light it up and enjoy the glow. 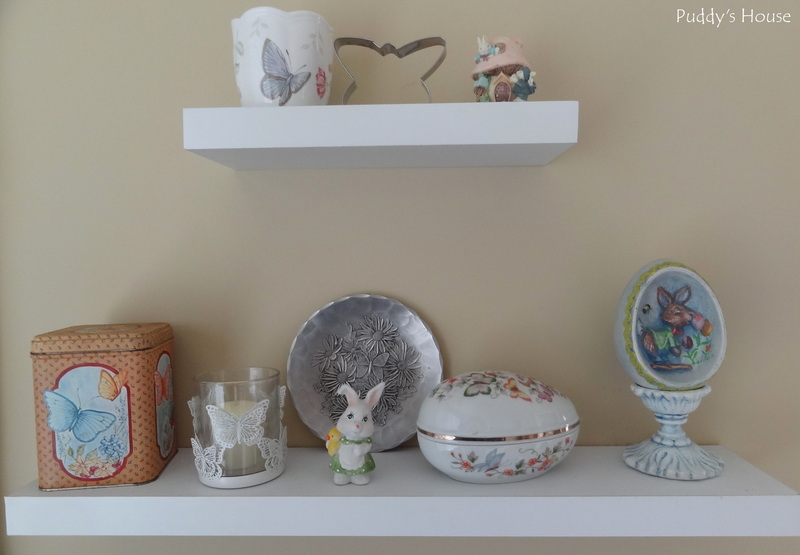 My craft room got a touch of Easter too on the floating shelves. I already had gotten out some of my butterfly decorations when I took down the Christmas and Winter ones. So, I just added the bunnies and egg. I even made use of our junk mail that I had shredded as the nest for the eggs. 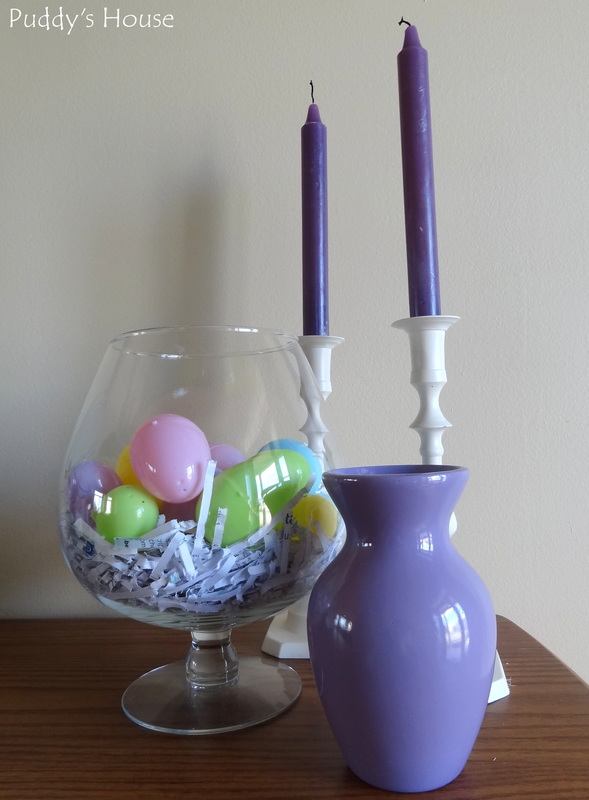 This is the first I found somewhere for the little purple vase and purple candlesticks. I’m not sure when or why I got them, but I must have known I would find a use for them some day. 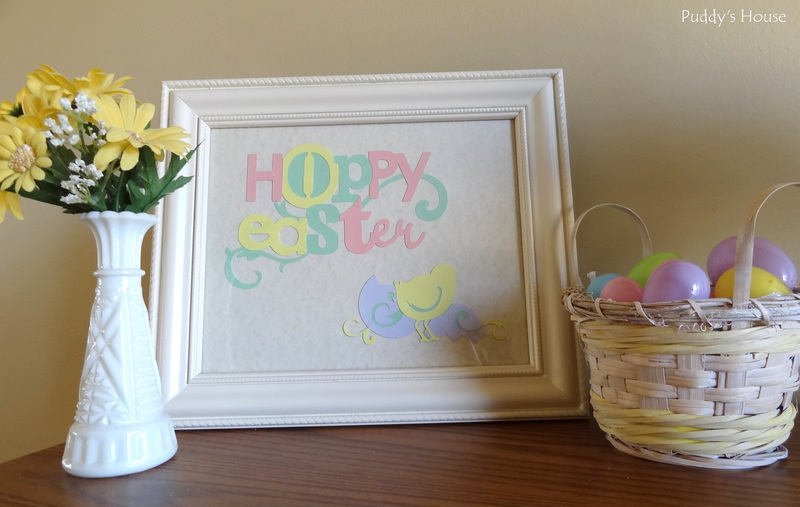 I made the Easter art using my Cricut. If you are a Cricut user, it is the Celebrate with Flourish cartridge. I realized it will come in handy for more than just scrapbooking our holiday memories. The vase of faux flowers normally sits on my desk, but I thought the touch of Spring flowers worked well with the other Easter decorations. I used more shredded paper as filler in the basket, so that the eggs were popped to the top of the basket. Are you enjoying a taste of Spring weather where you are? Have you decorated for Easter? 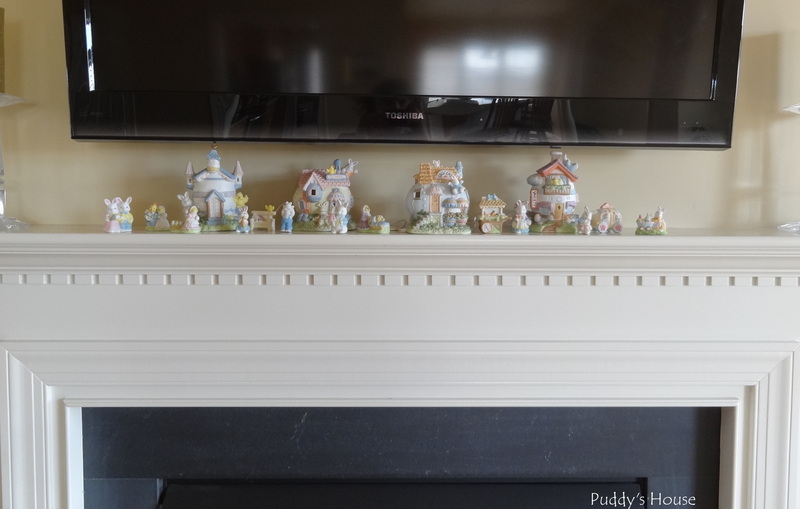 What are your thoughts….should the Easter village stay on the mantle, or should I move it somewhere else?